The Thunderbird Partnership Foundation is a non-profit organization that is committed to working with First Nations to further the capacity of communities to address substance use and addiction. We promote a holistic approach to healing and wellness that values culture, respect, community, and compassion. Our top priority is developing a continuum of care that would be available to all Indigenous people in Canada. The Honouring Our Strengths Renewal Framework document is the framework for this continuum – it outlines community development programs; services for the prevention, early identification, intervention, and treatment of addiction; and the important roles of mental health and well-being in all aspects of care. We are also committed to supporting the First Nations Mental Wellness Continuum Framework which is rooted in cultural knowledge and emphasizes First Nations strengths and capacities, building upon the Honouring Our Strengths Renewal Framework. As such, our work is guided by the four components of mental wellness outlined within the First Nations Mental Wellness Continuum Framework: hope, belonging, meaning, and purpose. The Thunderbird Partnership Foundation is a member of the Wharerātā Group which is an international network of Indigenous leaders working in mental health and addictions. We share a vision of the near future in which Indigenous peoples sustain their optimal health and wellbeing and contribute to that vision through strategic use of our Indigenous leadership influence on mental health and addictions systems. As of June 2015, the National Native Addictions Partnership Foundation (NNAPF) changed its name to the Thunderbird Partnership Foundation, a division of NNAPF Inc. Cultivating and empowering relationships that connect us to our cultural strengths and identity within holistic and healthy communities. The Thunderbird Partnership Foundation is the leading culturally centered voice advocating for collaboration, integrated, and holistic approaches to healing and wellness. 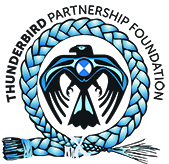 The Thunderbird Partnership Foundation is the national voice advocating for First Nations culturally-based addictions services.